The leaders agreed to continue meeting quarterly to continue their discussions. Cardinal Bechara Rai, Maronite Catholic patriarch, presided at the summit. “Eastern Christians are the first victims of the waves of violence in the region,” the leaders said, noting that Assyrians were the latest target as they cited the Islamic State invasion Feb. 23 of about 30 Assyrian Christian villages in the Khabur region of Syria. They called for the release of two Syrian bishops kidnapped in April 2013 — Syriac Orthodox Metropolitan Gregorios Yohanna of Aleppo and Greek Orthodox Metropolitan Paul of Aleppo. The number of Syrian refugees alone is equal to more than 25 percent of Lebanon’s population of about 4 million, putting Lebanon under great strain. “The unorganized entry of Syrian refugees surpassed Lebanon’s coping capacity at several levels, from security to housing, labor, health, education, transport and food supply, which has depleted a treasury that is reeling under the burden of debt,” the leaders warned. They also expressed a need to “prevent the temporary presence of refugees” from turning into a permanent presence, which they said would pose “a major threat to the unity and stability” of Lebanon. “The international community must realize that Lebanon’s capacity is limited,” they stressed. The leaders expressed “deep concern and disappointment” that the presidency of Lebanon remains vacant. The post is reserved for a Maronite Catholic under the country’s power-sharing system. The term of the previous president, Michel Suleiman, ended in May. Legislators have failed to agree on a successor. “The election of a president must remain a critical and vital issue because the Maronite Christian president is the guarantee for coexistence,” the leaders said. They applauded the feast of the Annunciation, March 25 — recognized by the Lebanese government in 2010 as an official national Christian-Muslim annual holiday — stressing that it enhances Lebanon’s message of coexistence to the world. About 33 percent of Lebanon’s existing population is Christian, with the majority Maronites. 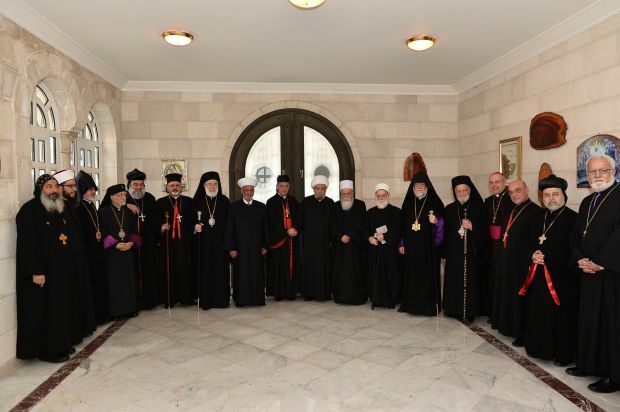 In addition to Cardinal Rai, attending the summit were: Melkite Catholic Patriarch Gregoire III Laham; Syriac Catholic Patriarch Ignace Joseph III; Syriac Orthodox Patriarch Ignatius Aphrem II of Antioch; Chaldean Catholic Bishop Michel Kassarji of Beirut, representing Iraq’s Chaldean Catholic Patriarch Louis Sako; Armenian Catholic Patriarch Nerses Bedros XIX Tarmouni; Catholicos Aram of Cilicia, patriarch of the Armenian Apostolic Church; Greek Orthodox Archbishop Elias Audi of Beirut, representing Greek Orthodox Patriarch John X Yazigi; and the Vatican nuncio to Lebanon, Archbishop Gabriele Caccia. Muslim representatives included Sunni Grand Mufti Abdel-Latif Derian; Abdel-Amir Qabalan, deputy head of the High Islamic Shiite Council; and Druze spiritual leader Naim Hassan.